Routes updated 13 June 2017. Take a road trip to clear your mind. Take in a few sights and bring home a spoon or other collector's item. 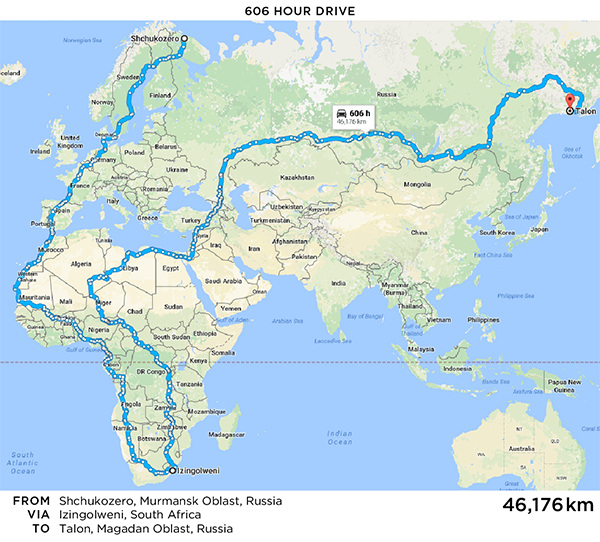 According to Google Maps, how far could you go? And the most pressing question: can you reach the sorrow at the world's end? Yes you can. 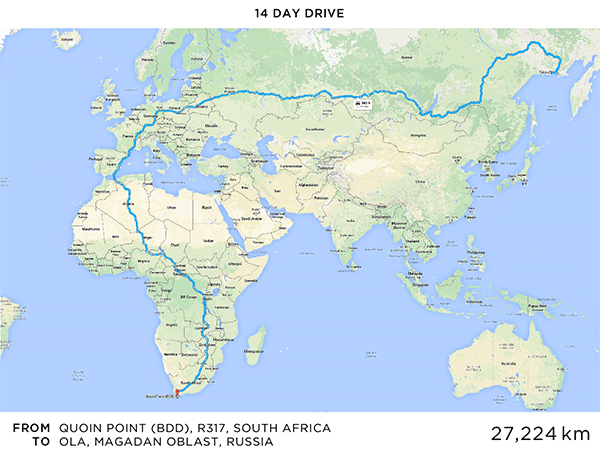 Each of the challenges below involves finding points A and B that yield the longest driving route in Google Maps. Each challenge has its own parameters, but certain rules apply to each challenge. Any solution to the challenge will surely have a shorter route (not available to the routing algorithm) as well as many more longer ones (duh—it's always easy to pessimize a route). Updates to Google Maps are frequent and unannounced, making most of you read here historical artefacts. I try to periodically make sure that the current challenge routes are at least functional. This topic has been previously discussed on xkcd forums. As Google Maps updates the routing network, some of the old routes are no longer available, or significantly shorter. This maps challenge page may therefore be out of date. Don't be surprised if links to old routes show a significantly different distance, or point to a route that no longer exists. Such links, or out-dated entries, are annotated as historical. historical Thanks to a route by Dean Sych, the 30,000 km limit has been broken again. And how! 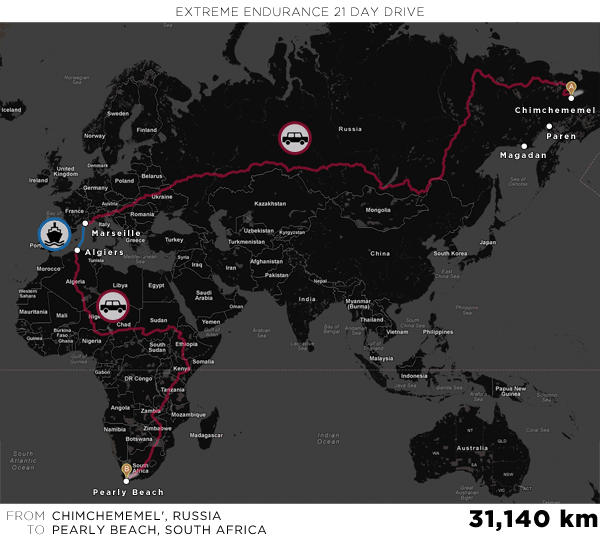 By over 3,600 km. Thanks Dean! Previously, because of new routes through central Africa, route distances dropped by about 6,000 km. Whereas before routing avoided Congo and Algeria, they now go right through them. This made a lot of the 30,000+ km routes much shorter. 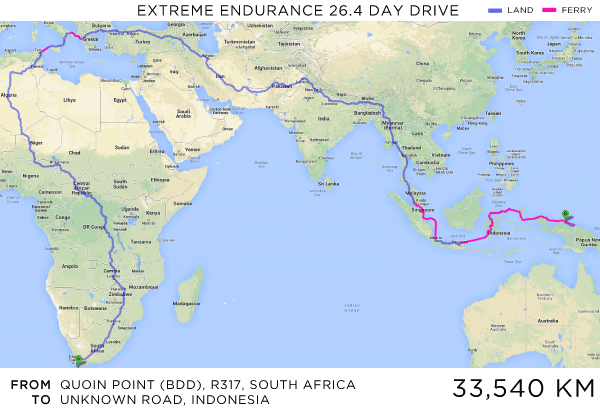 historical The longest route used to be 33,540 km from Quoin Point, South Africa to a dirt road in Indonesia. It starts with "Head northeast toward R317." and ends with "Turn left". After Malaysia, it's mostly ferries. Unfortunately, it's gone. Also, routing in Africa is now more optimized, shortening all the trips from south Africa. historical (Paren' no longer available as a destination) | The 30,000 km limit has been broken by a route from Paren' to Pearly Beach. This was furthered by discovering the bizarrely remote Chimchememel', Russia (from Chimchememel' to Danger Point). historical (Uelen still not accessible) | The next milestone for a route with ferries is 32,000 km. Unless you have the money to build a road to Uelen, this new limit is a significant challenge. Interested individuals should start digging immediately. historical Many of the interesting past routes are now gone—the world is getting boring. 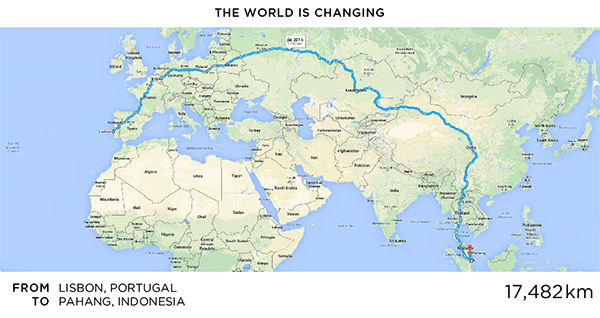 This fun 191 hour drive from Portugal to Malaysia, shown below, is no longer available. Too bad. Stop off in Turkey to go to the bathroom. Pick up a few aluminum centrifuge tubes from Iran, too. That sounds like fun. The details of the routing algorithm is the epitome of Rumsfeld's unknown unknown. 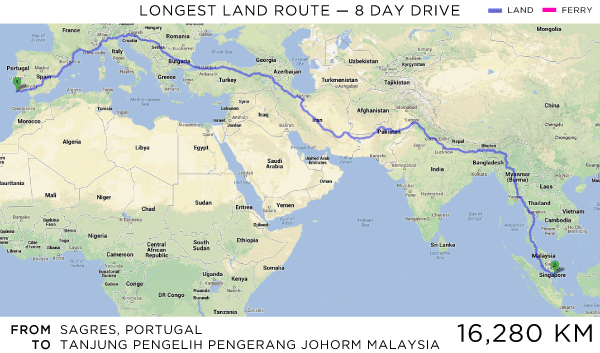 It used to be that Portugal to Malaysia was a very doable and relaxing 8 day drive at 15,787 km. And you managed to avoid China. Later, the route included China but excludes Iran. Apparently, we're no longer on driving terms with Iran. If you want to go from Lisbon to Singapore, you no longer need your Iran for Dummies book. Still, the updated routing was longer and burned more gas. Prius C drivers with advanced road endurance skills need apply. You know who you are. The 20,000 km all-land route limit still stands. Africa's complex routing may provide a solution. Or a local conflict that severs a road or two. 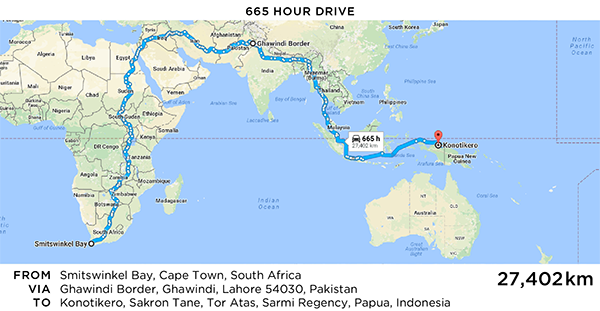 If you play with routes in Google Maps you'll quickly notice that some parts of the world do not appear to be connected to the smarts of the routing algorithm. For example, you cannot drive from Bejing to New Delhi (As of 31 Aug 2015 this is no longer true. 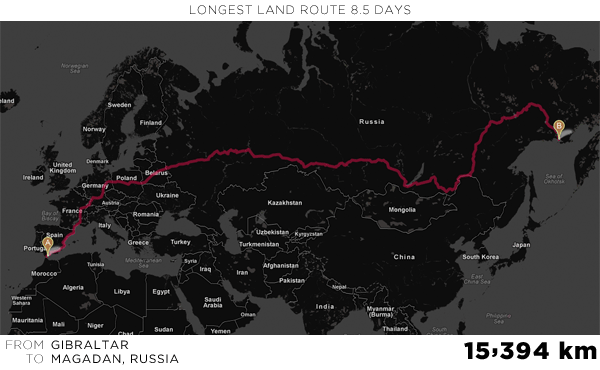 A 5,559 km route exists). These holes in the driving fabric pose a challenge in finding long routes. historical (no more kayak routes) | Google's subtle humour can be found everywhere (though apparently not anymore, since kayaking has been removed from maps and replaced by decidedly un-funny flight routes), such as in step 9 of this Seattle to Hawaii route, which states "Kayak across the Pacific Ocean — 4,436 km". If you have endurance training, you might wish to continue kayaking to Tokyo, for another 6,243 km. For the purpose of this challenge, kayaking is not allowed. These examples amply demonstrate that the internet was created by people with humor and is used largely by people without it. I say this because the kayak option has been removed. Doubtlessly because someone tried it, got hurt and the litigation lawyers got involved. It's always been the case that the 1% ruins it for the 99% of us. South Africa's Quoin Point is (or was, depending on the current routing) a common starting point for many of the routes. I'll have to visit this place next time I'm in South Africa and perhaps start driving north. Recently, I recieved a note from Charlie Kelly who wrote to thank me for inspiring him to put together a list of what to do in South Africa. There's also Jenn's list of 100 Things to do in South Africa—she won't be upset if you just do 2 or 3. No routes from North to South America exist because of this boggy marsh. As new routes become available, long trips become shorter. For example, introduction of a route across Niger and Algeria cut the original land route with no ferry record from 18,260 km to a mere 15,576 km. If you are interested in visualization and information, explore my global visualization of Google searches by language and find out where in the US people are searching in Chinese. For the morbidly curious, of interest might be all the really stupid questions people ask Google. Google Maps routes linked to from this page do not appear to work on iPhone's Safari browser (I have not tested iPad or iPod). A "driving direction not found" error appears. 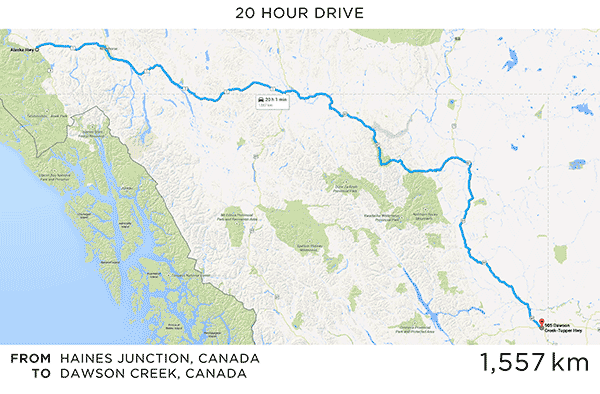 Rest assured, these routes do exist, and can be viewed on a browser on a PC or Mac. Weird. The routes below are the current answers to the challenge. Do you have a better (longer!) route? Let me know. Talon is at the end of R481, which goes from Magadan to Talon. This road forks off the P-504 which runs for about 2,000 km from Manday to Magadan. 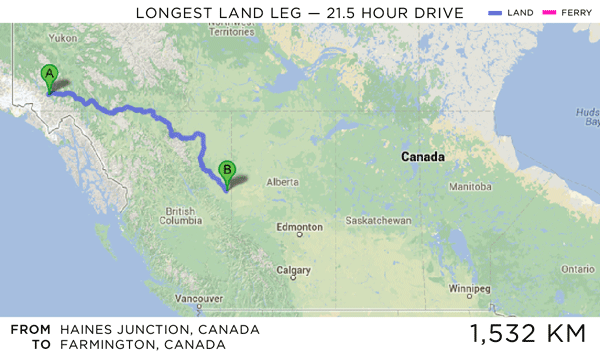 Thanks to James Robertson for finding this exhausting 2,121 km single leg trip. 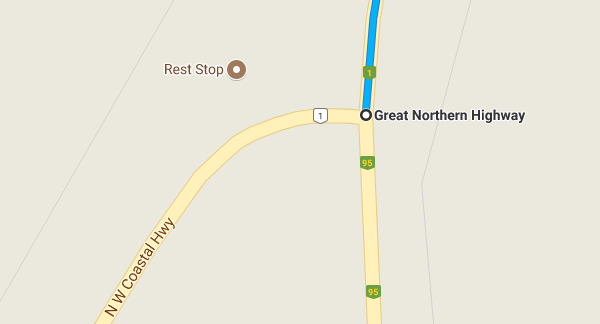 It's a route along Australia's National Highway between Kathernine Hot Springs and (2,121 km later) a fork in the road that splits into the NW Coastal Highway. 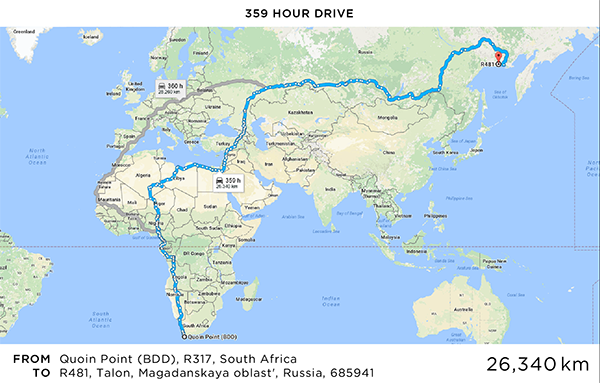 I'm sad to see that the route no longer includes Magadan, known as the sorrow at the world's end, which is such an important destination for the Google Map Challenge. On the upside, this route is so long that "Your destination is in a different time zone". Depending on which way you drive, this might save you an hour. What happens when you get to the end of the route? You get a much deserved rest stop. Hilarious Aussie humor at its best. These routes may no longer be available in Google Maps or their routing may have changed. 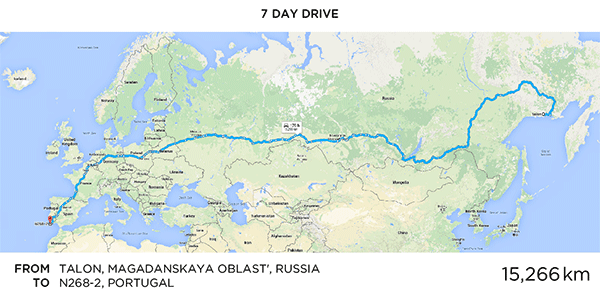 The longest Google Maps route that does not use ferries takes us from Sagres in Portugal to Khasan in Russia. 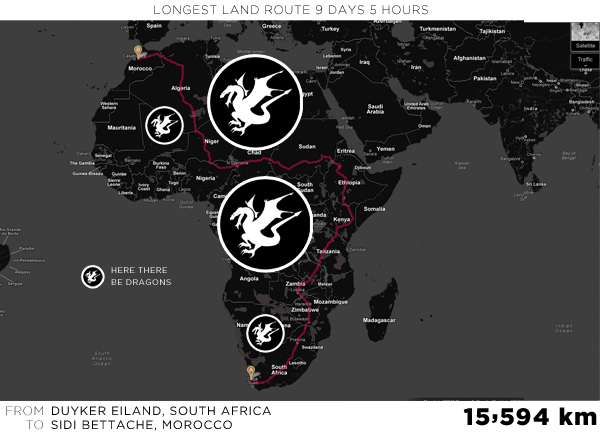 Thanks to Pieter Vandromme for submitting this route. v7 route Sagres in Portugal to Khasan, Russia 14,069 km. 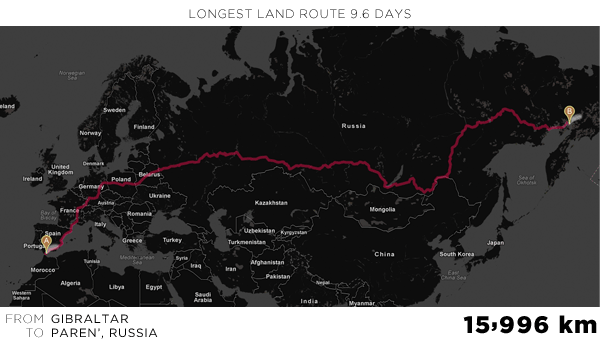 This route is now significantly shorter (13,322 km). 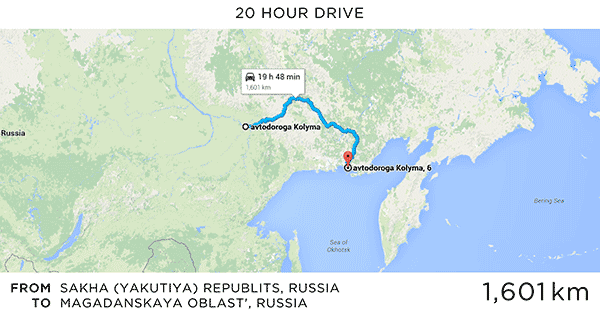 The longest Google Maps A–B route that uses ferries. The ferry distance cannot be more than 25% of the entire trip. Sadly, it appears you can no longer drive from Quoin Point to Indonesia. 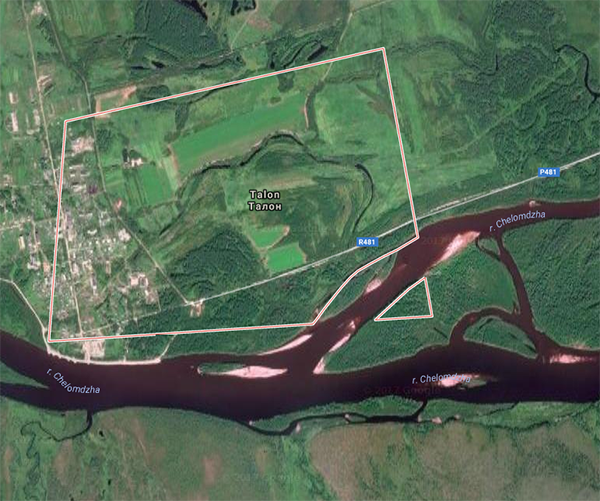 So, Talon in the Magadanskaya oblast' is back as everyone's favourite gulag town destination—truly the last stop for sadness. 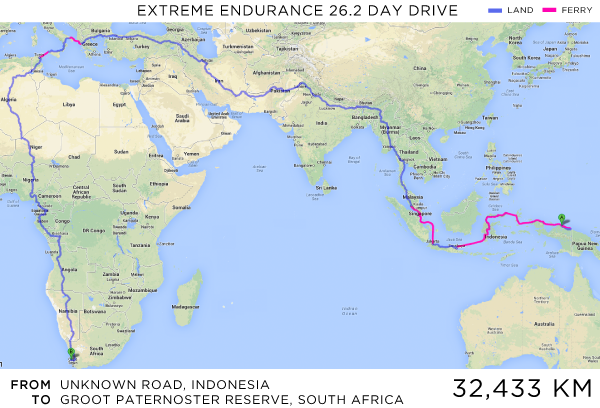 To make matters worse, this route is now only 26,320 km, which is shorter than the original entry for this challenge. Sad! v12 route (7 Sep 2015). 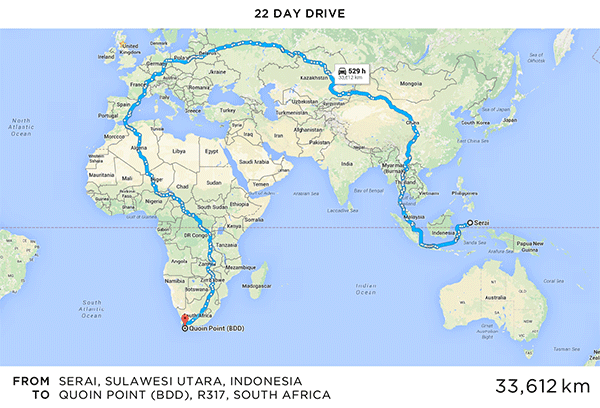 This route takes you from Quoin Point on Cape Agulhas to the edge of Indonesia, where there are things to do. For some reason this excellent route was dropped by Google Maps. Its creator, Christopher Camitta, points out that if you assist the routing algorithm by adding a mid-point in Pakistan, the route can be recovered. 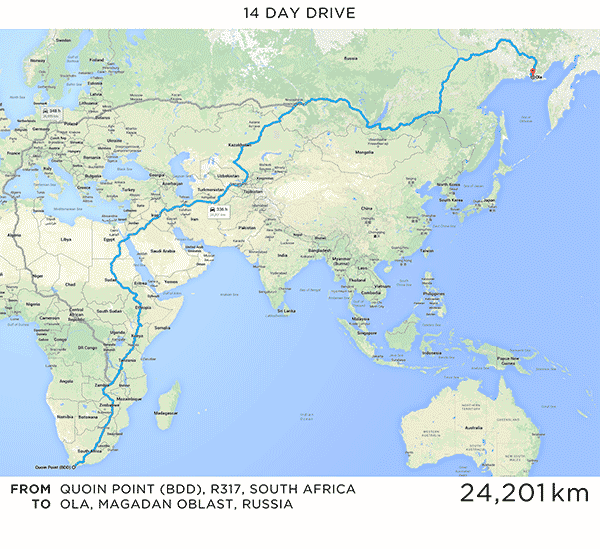 v11 route (7 Sep 2013) Quoin Point, South Africa to Talon, Russia 27,224 km (Google map route). 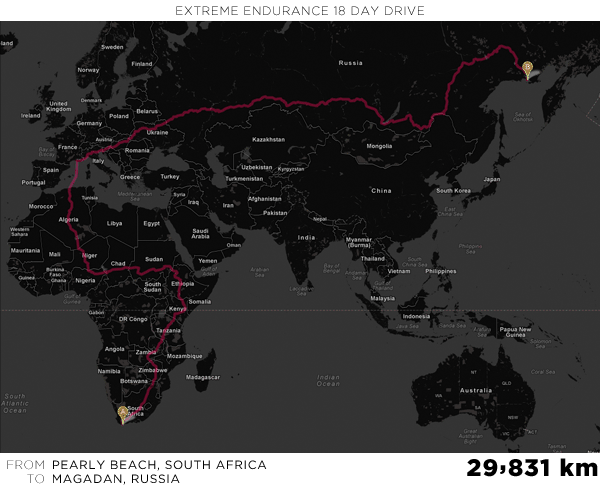 This route takes you from Quoin Point on Cape Agulhas to the edge of nowhere in Russia. During your voyage, you experience the endless visual monotony of sprawling Africa (keeping a wide bearth from Angola), only to end up at the sorrow at the world's end—Magadan, Russia's gulag region. 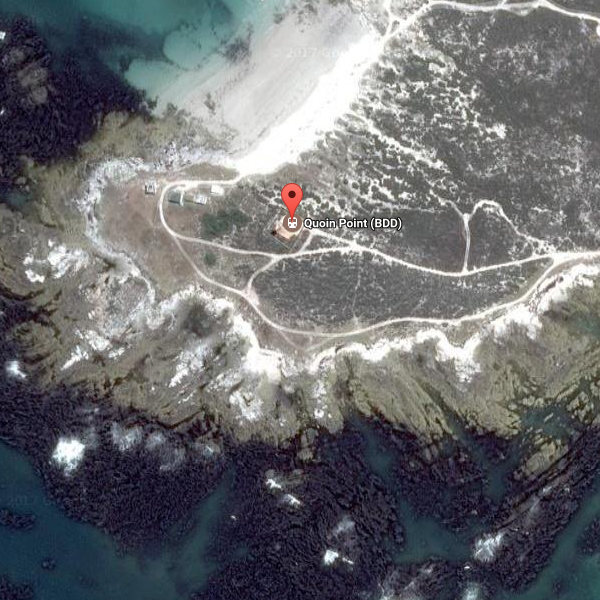 v10 route (18 Jul 2013) Quoin Point, South Africa to Ola, Russia 24,201 km (Google map route. 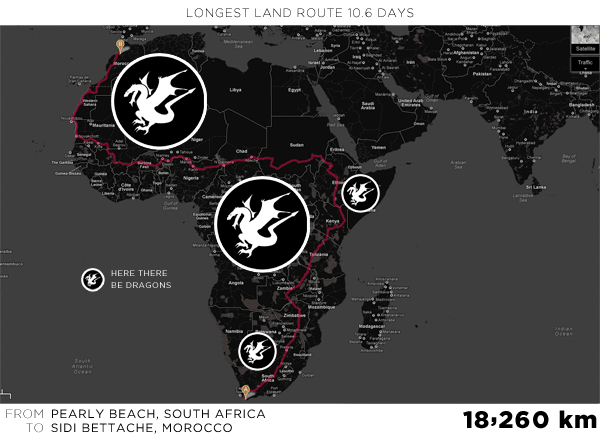 Thanks to Pieter Vandromme for submitting this route. Thanks to Nico Tsaousis for suggesting the format of this challenge. The 3-point route must be constructed by typing in the waypoints, not dragging them. 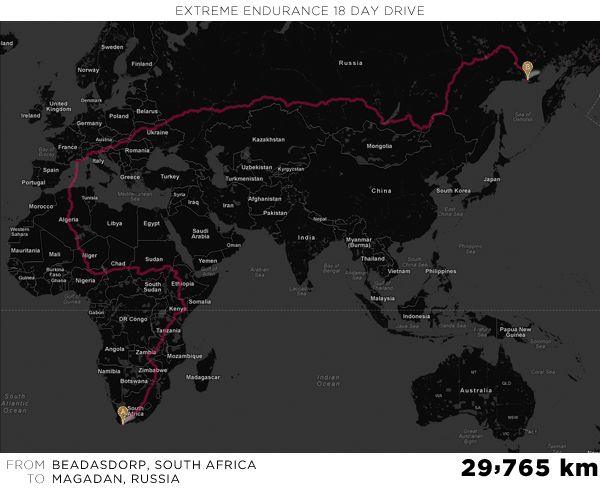 Nico came up with the first entry (see v1 route below), a 33,156 km route from an Unnamed Road in South Africa to Magadan via Norway. 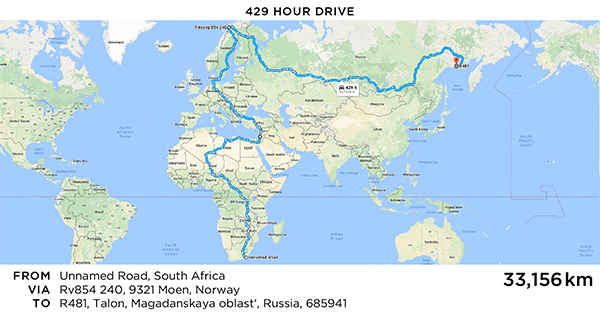 The current longest route in this category is a 48,504 km trip from the Mou Shkola P.kharp high school in Severnyy Kvartal in Russia via South Africa back to Talon in Russia. The route was submitted by Brad Bailey and requires the "avoid ferries" option. 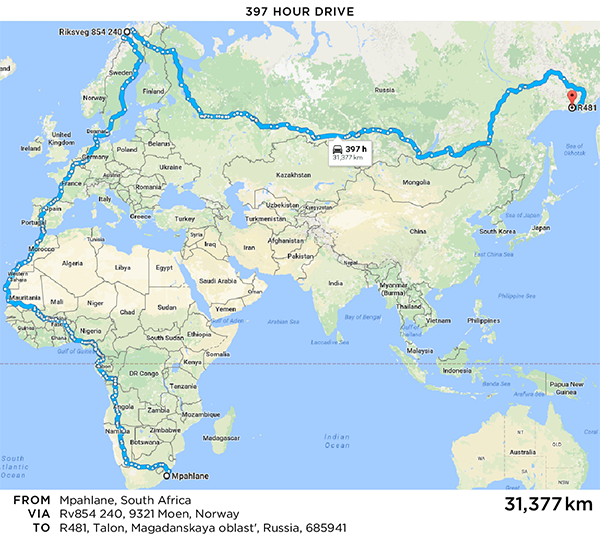 v3 route Shchukozero in Russia via Izingolweni in South Africa to Talon in Russia (Google map route 46,176 km). This route requires that you select "avoid ferries" as well as "avoid tolls". 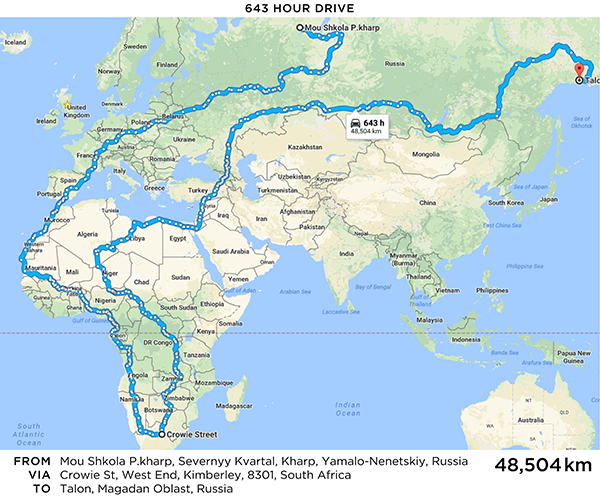 What makes this route really unique is that it starts and ends in the same country. 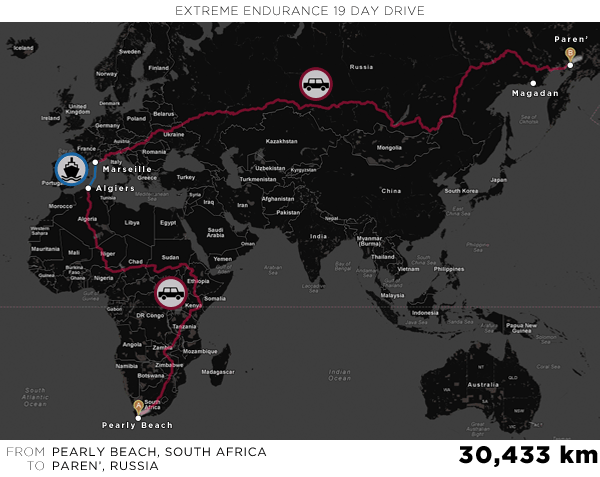 v2 route Mpahlane in South Africa via Riksveg in Norway to Talon in Russia (31,377 km). v1 route Unnamed road in South Africa to Talon in Russia (Google map route, 33,156 km on 14 Jun 2017). Because this route starts at an "unnamed road" rather than a specific address, I'm retiring it and replacing it by one that starts at Mpahlane in South Africa.